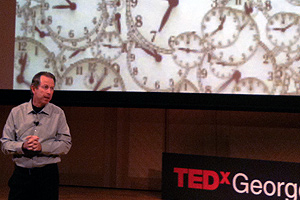 Carmel presented his work on time zones at TEDxGeorgetown on March 23. Accustomed to addressing students and other academics, Professor Erran Carmel saw a new challenge in TEDxGeorgetown: to make a rich academic topic palatable and comprehensible to a broader audience -- all in under 20 minutes. "What TED does is try to present ideas that are fresh, contrarian, non-obvious. I kept that very much at the forefront when preparing," Carmel said. "It's a challenge speaking at TEDs, but also an honor." An offshoot of the popular California-based TED conference, TEDx are local, self-organized events that bring people together to engage in inspiring ideas centered around a theme. In this case, the theme was "Netcetera: The Internet and Everything Else." Videos and eleven speakers were combined to present on the multitude of ways the Internet affects us. Carmel's speech, "The Internet and Time Zones," looked at the experience of multinational companies and their global workforces. Common wisdom dictates that "distance is dead." By extension, are time zones dead too? "The Internet hasn't erased time zones," said Carmel in his speech. "It has made them even more problematic." Along with Associate Professor Alberto Espinosa, he has conducted several experiments that simulated global working environments. Their findings indicate that the quality of work suffers when workers are spread across far-flung time zones. A veteran scholar of the globalization of technology, Professor Carmel has studied hundreds of firms—in America, Europe, China, India, Israel, Brazil—and their employ of timeshifting, what he calls "the dirty little secret of globalization." Timeshifting occurs when one worker alters the structure of their day to work simultaneously with a colleague in another time zone. Carmel is a tenured professor of Information Technology at Kogod and has written over 80 articles, manuscripts and reports. In 1999, he published a book called Global Software Teams, a work that helped many organizations explore distributed operations for the first time. His second book, Offshoring Information Technology, has been widely successful in outsourcing and offshoring courses. His next book, co-authored with Espinosa with the working title I'm Working While They’re Sleeping: Coordination Across Time Zones, will be out soon. Keep up with time zones and Carmel's work at his blog.